Those of you who are active on the social circuits would have certainly heard of the restaurant, Soda Bottle Openerwala, a chic new take on the legendary Irani cafes of Mumbai. Soda Bottle Openerwala is not a bad deal, the food is decent and the décor is well, interesting. But that’s where it ends. Too many people now are happy to have a “dolled up version” of the experience, never mind that the real deal can be awe inspiring and seeped in nostalgia. Visiting an Irani Café in Mumbai should be an experience mandatory to all residents, especially since they are a rapidly dying out species. As you step into the café, time seems to stand still. The past hangs heavy in the air. Most of these cafes are ‘same same but different’ – they have certain characteristics which are common to all such cafes, but also their own set of quirks which define their own individual character. The similarities start with the décor, lightweight black chairs (imported from Poland) with plastic weaving at the seat) and the tables covered with checkered red tablecloths. Don’t miss the old world bakery counter, the cash counter (stocked with various household provisions) and the shelf full of glass jars containing various delicious treats. So that you can enjoy the experience as much as we do, here is a list of things to do when visiting these quaint nostalgic setups. 1. 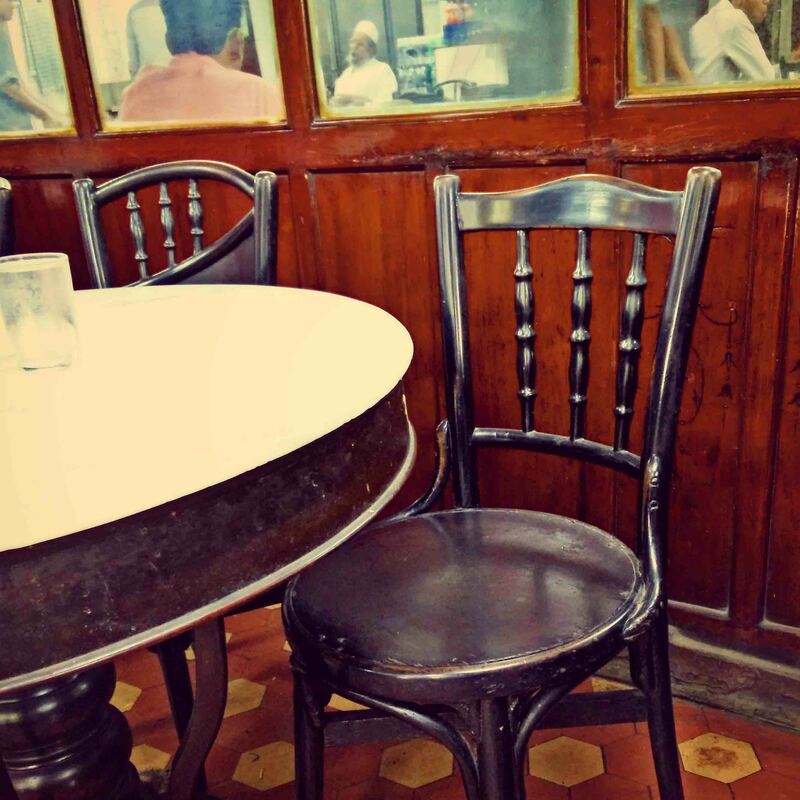 Irani Cafés allow you to indulge in some serious people watching. They are all located in the middle of bustling areas (and interestingly enough, almost always on a street corner). It’s great fun to see the variety of people that come in, grabbing a quick chai in the middle of their busy day. Because tables at the cafes are shared, you will also find yourself sitting next to someone unknown. 2. Try and strike up a conversation with the owner (hint: he’s the old man sitting behind the cash counter). They are traditionally known to be grumpy (especially if you do not tender exact change), but all the owners we’ve met have been absolute sweethearts. 3. 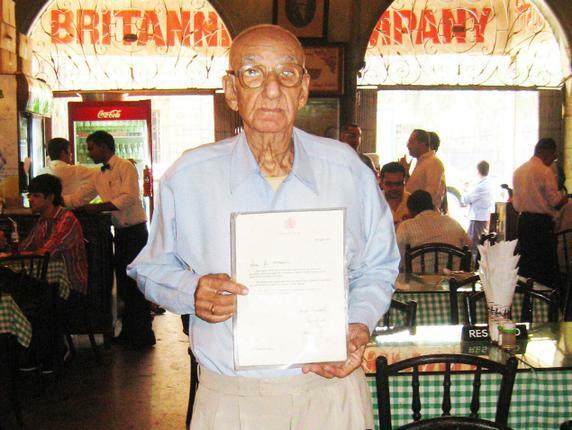 Britannia & Co at Ballard Pier is best known for its adorable owner, the charming 95-year-old Boman Kohinoor. Mr. Boman is a born storyteller. He loves sharing stories and anecdotes. He will proudly take you through his collection of sepia-tinged collection of treasures; letters, cards and photographs from famous diners who have visited Café Britannia. There is even a postcard from the Queen of England in there somewhere. Boman Kohinoor with the letter from Her Majesty, the Queen of England. 4. Brilliant food, served at the speed of light. From Irani tea (sweet and comforting) to brun maska (break and toast), jam-bread, omelette, akuri (a popular Parsi-style egg preparation) caramel custard, pastries and more. Wash it down with Pallonjee’s Raspberry beverage, another legendary Parsi item. 5. Merwans at Grant Road serves the world’s best mawa cakes (no kidding). The catch? They runout of stock by 7am, so it’s awfully hard to get to! 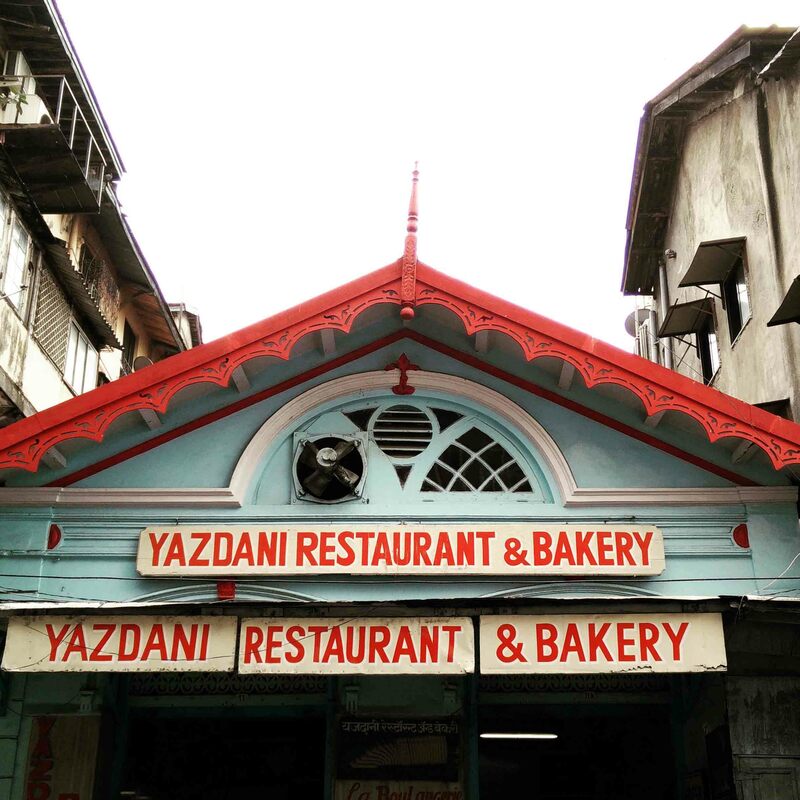 In case you miss out, visit Yazdani & Co at Fort for delicious apple pie (the heritage setting makes it taste better, I swear) or Britannia for caramel custard. Kayani & Co offers some lovely banana bread. 6. Here’s the best part – you can stuff your face silly but try as you may, it’s unlikely that your bill will cross into triple digits. (unless you visit Britannia, that place is more expensive). In your face, inflation. 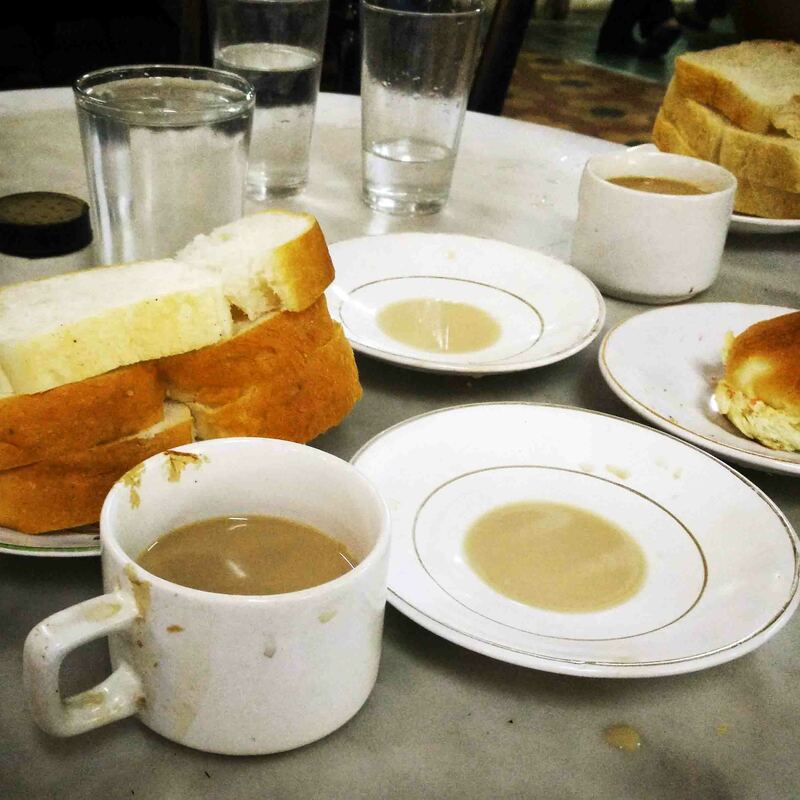 A classic case of going, going gone is Mumbai’s fading Irani Cafes. Bastani’s (Metro) closed down recently, it’s only a matter of time before other fatalities are added to the list. 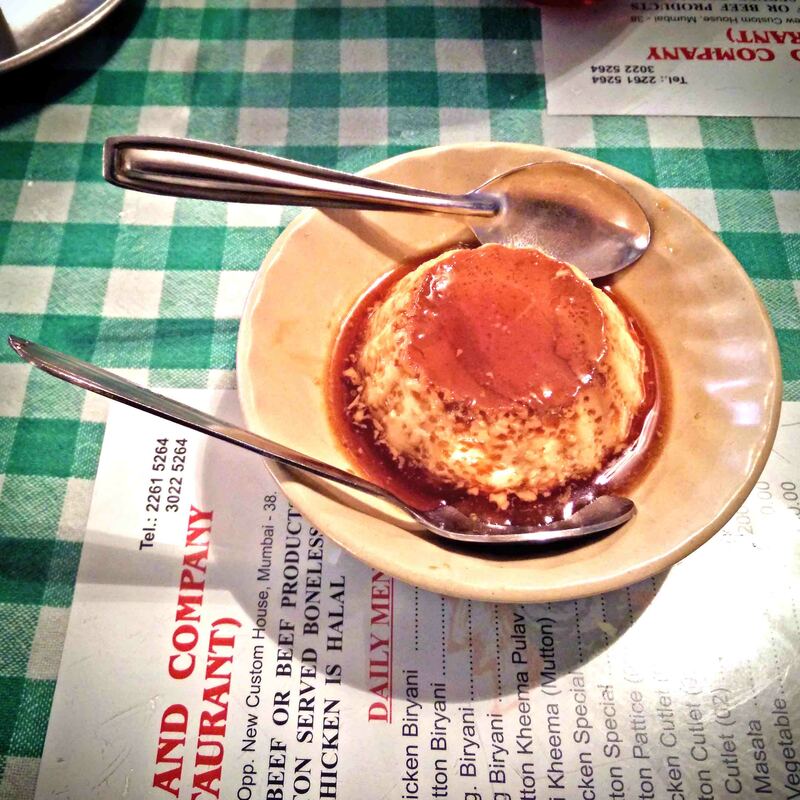 Till then, we’ll continue to enjoy the delicious caramel custard and wash it down dollops of nostalgia.